Traffic now routinely comes to a standstill at hotspots like Pt. Lobos, Bixby Bridge and Julia Pfeiffer Burns. Tourists park cars blocking the lane. Pedestrians run through narrow gaps in traffic to reach popular parks and trails. “Whale jams” appear wherever feeding humpbacks draw a crowd. There are times when traffic is stop and go from the Big Sur Valley to Carmel and beyond. Many have called for drastic measures to be taken in the name of safety (as well as in the name of resource protection – but that’s a topic for another day). Suggestions include imposing a toll, limiting entry and requiring reservations, banning roadside parking near popular attractions, banning large RVs, and even banning bicycles. What there hasn’t been a lot of is actual data. Data capable of allowing us to separate the merely annoying from the actually dangerous. Which is why I’ve created this map. Its purpose is to provide real information, based on Highway Patrol accident reports about what kind of accidents are happening, and where. Obviously, it is not perfect. It is based on imperfect data and I have doubtless made some mistakes in getting it onto the map. The locations of individual accidents are approximate and the most recent are the least exact, as the Highway Patrol, beginning in August 2015, began using vague descriptions, rather than mile post markers, to locate accidents. It is also likely that the descriptions of what caused accidents are sometimes in error. Like my fire maps, this map is intended to give an informative overview, rather than precise boundaries or definitive information on specific incidents. The map covers the 72 miles of Highway between the Carmel River and the Monterey County line, and the past three years (2014-2016). Marked on the map are the 356 accidents reported by the Highway Patrol during this time (104 in 2014, 136 in 2015, and 116 in 2016). These accidents resulted in injuries to 173 people (56 in 2014, 69 in 2015, and 48 in 2016), and 7 deaths (3 in 2014 and 2015, 1 in 2016). Single-vehicle accidents caused by a failure to stay on the road were the most common (164 accidents), suggesting that the twisting nature of the road remains the greatest hazard, but the next most common cause of accidents (vehicles rear-ending slowing or stopped traffic) is clearly related to congestion. 61 accidents were caused in this way. Other significant causes of accidents were drifting into the wrong lane (28 accidents), hitting objects in the road (24 accidents), unsafe passing (20 accidents), and left turns and U-turns into oncoming traffic (20 accidents each). 6 accidents involved pedestrians (5 in 2014 and 1 in 2015). 2 were pedestrians hit by backing vehicles in turnouts, 3 were pedestrians actually in the roadway, and 1 was the woman tragically killed at Julia Pfeiffer Burns when she was rolled over by her own car. Interestingly, none of the three pedestrians hit in the roadway were hit at the major trouble spots (like Pt. Lobos, Soberanes, Bixby and Julia Pfeiffer Burns) where it’s been suggested that Highway parking should be banned in the interest of pedestrian safety. Bicycles were involved in just two collisions. The first, between Palo Colorado and Rocky Creek, was hit by a driver making an unsafe turn (the kind of accident that could befall a cyclist anywhere). The second, near Kirk Creek, was sideswiped by a car (exactly what the anti-bike crowd has long predicted would happen to cyclists in Big Sur! ), but did not sustain any injury. A lot of people either drive too fast or don’t pay enough attention, or both. The intersections of Sycamore Canyon and the Old Coast Rd. (at Molera) with the Highway are even more dangerous than I thought. There are a lot fewer accidents than you might expect at Bixby Bridge (although there are plenty at the other congestion hot spots). Accidents anywhere in the vicinity of Rocky Creek inevitably result in injury. 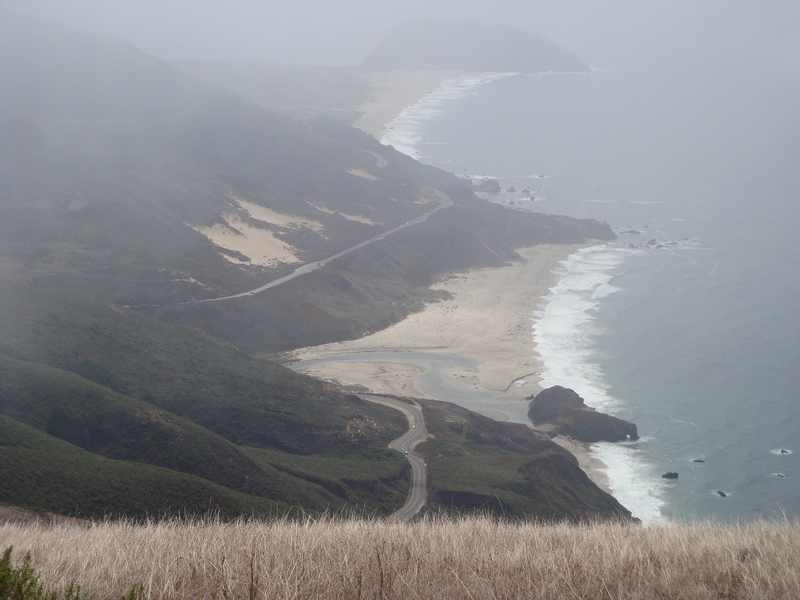 A large section of Highway, with Esalen at its center (from just south of JPB, nearly to Big Creek), is the safest stretch of road on the coast. Maybe all the serenity emanating from Esalen has an effect on drivers? Blue pins are non-injury accidents. Orange pins are injury accidents. Black pins are fatal accidents. This entry was posted on Saturday, March 18th, 2017 at 3:53 pm and is filed under Big Sur, Cycling, Politics, Transportation. You can follow any responses to this entry through the RSS 2.0 feed. You can leave a response, or trackback from your own site. I remember this fatal accident from Dec. 2016, a local who hit a tree. If I click through all the black pins, I will probably remember then all. Quite an endeavor, XT. Thank you. Excellent data collection not to mention presentation! Kudos indeed! My first pass leads me immediately to the conclusion that MANY accidents are not reported to CHP… I checked the Palo intersection and can think of at least 4 accidents there in the past 2 years myself, 3 with injuries (fortunately not severe). My second thought is that a couple of reasons for fewer accidents reported at trouble spots like Bixby (that count btw also well below my personal count) might be that there is no reliable cell coverage, the CHP can’t get there thru the traffic, and people are stopped or moving so slowly that results are unreported fenderbenders, mirrors off, & stuff like that vs reportable accidents. In other words the issues are not really safety ones per se though they are happening…. But any data is really a great start. Now if we could only get some serious traffic counts over a range of times… that would be extremely helpful! XT, this is really terrific. I am not sure how you and Big Sur Kate have the time to collect and relay the most accurate information anywhere. This is what we need to have an intelligent discussion on how we keep Big Sur from being completely ruined. Looks like congestion itself is a major safety issue. I am actually glad to see bikes are not anywhere near the top of the list of causes. I hate to see people peel off a whole segment of the population from the discussion and put them on “the other side”. I have friends who have ridden their whole life in other parts of the country and Big Sur is on their bucket list. I think the challenge is keeping more people from kicking the bucket here! Thanks, Keith, for shedding light on these crashes—and for all your good work in our county. The Big Sur coast now draws toursim traffic at rates more equivalent to a National Park than to the patchwork of State Park, National Forest and private lands that Big Sur currently is. One wonders if Senator Cranston and Ansel Adams might be chuckling about this when looking down upon the former “lonely coast” from their heavenly perch. Fabulous summary of traffic/accidents along our beautiful scenic highway.